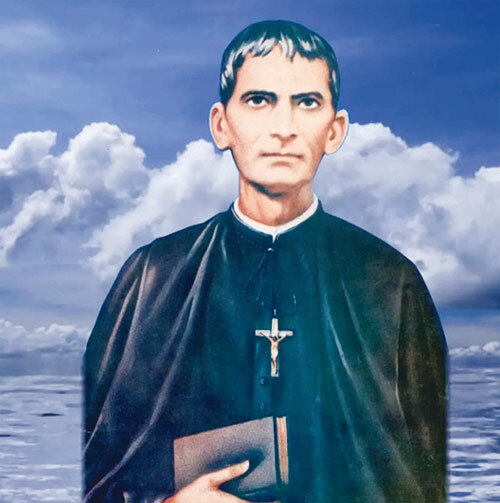 of Goa Archdiocese, a candidate for Sainthood, whose process is going on in Rome, was born in Anjuna on January 21, 1869. Hence, Monday, January 21, 2019, will mark the one and a half centenary of his birth. Young Agnelo grew up with Christian virtues inculcated by his parents and siblings, humble in his demeanour, weak in health and yet endowed with high intelligence. His life is a model and his dedicated service has been an inspiration to all. Fr Agnelo lived a life of detachment. Throughout his life, in word and deed, he strived to bear witness to Christian values. Burning in the love of Jesus from a young age, he imbibed this same love and mercy of God in himself and enkindled it in everyone he came across. Ve. Agnelo was a product of the Patriarchal Seminary of Rachol, where he completed his theological studies with distinction and ‘Accessit’ in 1893. As a deacon, he joined the Society of Pilar, making his first profession on May 22, 1898 and was ordained priest on September 24, 1898. He went wherever he was sent to spread the fragrance of Christian truths in simple words in his sermons. It was a difficult time, when the Government in Portugal and all its colonies, including Goa, had fallen into the hands of Freemasons, who were anti-clerical and anti-religious, and the Catholic faith and values were being threatened for 93 years from 1835 to 1928, when all religious orders had been banned. The first 10 years of Fr Agnelo‘s priestly life were spent in meditative silence, prayer and penance at the Pilar Monastery, in total obedience to the will of his Superior. He often helped the Superior in teaching the catechumens and preaching during retreats held at the Monastery, in which priests and the conscientious lay people including judges, lawyers, civil officers, doctors and businessmen participated. Due to the ban on religious institutes, nowhere else were closed retreats preached in Goa, during that period. He made his perpetual profession in the Pilar Society on September 8, 1908. Seeing his aptitude, the Archbishop-Patriarch of Goa then appointed him as confessor of the Rachol Seminary students from 1908; at the same time he worked as a pastor of souls, first in Shiroda, then in Kumta (North Kanara, which was then part of Goa Archdiocese, now in Karwar diocese), and later in Sanvordem. In 1919, he was appointed resident Spiritual Director at the same Rachol Seminary where he worked till the end of his life; there he prepared a legion of future priests who would be great preachers and pastors of souls. His preaching ministry continued throughout his life, covering almost all the Churches of Goa. He preached his last nine-day Novena of the Sacred Heart of Jesus at the Seminary Church, eulogising God’s love in the Most Holy Eucharist. He fell on the pulpit with an attack of apoplexy, while preaching the last sermon on the Vespers of the same novena. He died a few hours after his fall, at dawn of November 20, 1927 at the age of 59. Buried in Rachol cemetery, his remains were exhumed and transferred to Pilar Monastery on January 10, 1939. Since then, Pilar has become a centre of pilgrimage and thousands of favours are reported, thanks to his intercession.